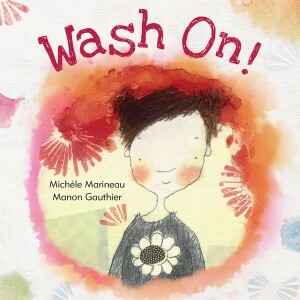 “Michèle Marineau has written a story for the smallest of us. When we are tiny, sometimes we feel unimportant and overlooked, especially if we live in the shadow of an older sibling. Petronilla’s ability to cause chaos, not only throughout her own household but across the globe, is sure to amuse. Readers will revel in the attention Petronilla commands and the circus of colour she unleashes on the world. Anyone who has ever taken things a little too far will also identify with Petronilla’s concern for her lost dog and her consequent change of heart. Wash On! may be based on a silly situation in which colours are transferred rather than cleaned off but the story actually has several powerful messages hidden in that imaginative scenario. First, Wash On! focuses on the joie de vivre of a world filled with colour. We all need a little colour in our lives…But like anything, it is possible to have too much of a good thing, as everyone learns, including Petronilla. Once the colours explode and there is no contrast and no way to differentiate objects, that joy is lost, like the dog, in an overabundance of stain. Splashes of colour are wonderfully invigorating and therapeutic but excesses are debilitating and even harmful. Second, Governor General award-winning author Michèle Marineau recognizes the power of children in defining the world and their need to manage their own circumstances. Her family may think of Petronilla as chaotic but she seems to just want a hand in determining the life she will lead. Michèle Marineau tells powerful stories in her native French language and this translation by Pajama Press’s Erin Woods highlights that poignancy with merriment and spirit. That same boldness is depicted with daring by Manon Gauthier’s mixed media illustrations. Manon Gauthier…continues to do amazing things with gouache, pencil and paper collage, ever different and totally wonderful. CM Magazine says “Be swept away in the magic of colour” in Wash On! “Be swept away in the magic of colour as Petronilla and her family paint their home and town with every touch! Wash On! brings colour and life to a world in which Petronilla feels is too dull and boring at times…. Manon Gauthier’s mixed-media illustrations are captivating and inventive. Her use of gouache, pencils, and paper collage provides depth and layers to each setting…. —Kelsey Sukich is a French-immersion kindergarten teacher at École Rivière-Rouge in Winnipeg, MB. She loves exploring the power and expression of colour with her kindergarteners!